In a stunning coup, Arkansas will hire Wisconsin's Bret Bielema as its next football coach, Yahoo! Sports has learned. Bielema, who has taken the Badgers to three straight Rose Bowls, was nowhere on the radar amid months of speculation over who Arkansas would hire. An announcement will come Tuesday, sources told Y! Sports, but Bielema is not expected to be introduced until Wednesday. Details of Bielema's contract at Arkansas are not yet known, but the school was said to have a major war chest for this coaching search. Bielema was making $2.5 million at Wisconsin. The Badgers will now be scrambling to fill a vacancy they likely never saw coming. Pittsburgh coach Paul Chryst, a former offensive coordinator at Wisconsin under Bielema, could be a leading candidate to come back – a development that would truly be disastrous for the Panthers, who already have had three head coaches in the past three seasons. Another potential candidate and former Badgers assistant would have been Dave Doeren, who guided Northern Illinois to the Orange Bowl but was just hired Saturday at North Carolina State. Bielema, 42, is leaving the only job he's had as a head coach, and the school where he has worked since 2004. 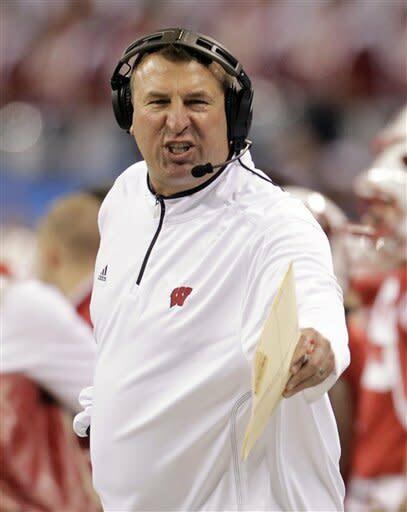 Bielema was defensive coordinator for two seasons under Barry Alvarez before becoming Wisconsin's head coach in 2006. He's gone 68-24 in Madison, with four seasons with 10 or more victories. Wisconsin advanced to its third consecutive Rose Bowl Saturday with an upset romp over Nebraska in the Big Ten Conference championship game. Arkansas suspected last spring that it would be searching for a head coach at the end of this season, after hiring John L. Smith as its interim coach. Smith succeeded Bobby Petrino, who was fired following a scandal involving his mistress, who he had hired and put on the Arkansas payroll. The only way Smith could have kept the Arkansas job full-time was to have a glorious season, and the Razorbacks fell well short of that. They went 4-8 after starting the season in the top 10. So Arkansas athletic director Jeff Long had a long time to plan his search, but it still took a while before settling on Bielema. There were preliminary talks with LSU coach Les Miles that both sides said did not result in an offer, as Miles re-upped with the Tigers. Several other names were floated over the past several weeks, while Bielema's name never hit public radar until today. It will be an interesting fit for Bielema, who has spent his entire playing and coaching career in the midwest. He was a nose guard at Iowa and an assistant coach at Iowa and Kansas State before moving to Madison. But clearly Long was less worried about getting someone with Southern ties than he was getting someone with an established winning record. Although Bielema's winning percentage of .739 is the highest of any Wisconsin coach since George Little in 1925-26, he struggled to escape the shadow of program architect Alvarez – who remains at the school as its athletic director. Wisconsin's relatively modest facilities might also have been an issue for Bielema – a problem he will not encounter at Arkansas.